This entry was posted on Friday, January 25th, 2008 at 9:53 pm and is filed under Plain Old Fashioned Stupidity, Professional Stupidity. You can follow any responses to this entry through the RSS 2.0 feed. You can leave a response, or trackback from your own site. This brings to mind forms that have to be filled out that seem miles long and say the same thing over and over again. I always wondered who the stupers were behind such things. Long receipts are the same. Ridiculous! Agreed. To make matters worse, my grocery stores prints out a ton of coupons that match up or are similar with the items you have purchases to entice you to come back again. The catch is, you have to buy about 4 of each product to get the deal. No thank you to the extra paper and extra spending. About half my grocery reciept is devoted to telling me how much I “saved” by using my “discount card.” I hate those friggen things. Those forms are very redundant, aren’t they? I’d like to tie a few of the lawyers up who write up those things and read them out loud to them over and over…just for giggles. I agree – these people behind the print-outs actually believe extra paper will entice customers to spend more. Maybe stupermers (stupid customers) will. Your comment sent an immediate snapshot to my overworked mind of a poor, innocent tree being kicked. Oh, how cruel! I broke up with Sears a year ago. Sears is a stuper; I’ve suffered atrocious customer service from them. Also, I have a professor who was refused service from Sears. She wanted to buy a normal push mower from them, and the salesman refused to sell it to her and tried to push a lighter model because she was a “little lady.” I know someone else who went to Sears to buy power tools and was told she should come back with her husband, because she shouldn’t be making those kind of purchases without a man’s input. I agree with all of you. 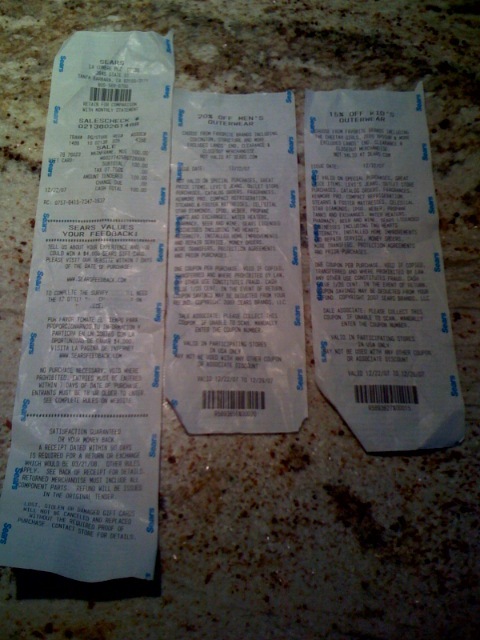 Many stores have receipts that are far too long. If they are smart they are monitoring the blogs and taking appropriate action. The only way we have an impact is by continuing to blog and making sure we name the stores that are creating such waste. In June there were people blogging about how Lowe’s receipts were way too long and had a ton of white space. Then just a month later there were national news stories aired about how Lowe’s was making efforts to eliminate the waste from their receipts. This works! Keep blogging about this and don’t forget to name names. Thank you for this article.. Ill bookmark it so that i can read every chapter. I read a few of your other entires.